Last week, the biggest story in pro wrestling was the civil trial victory of CM Punk (real name Phil Brooks) and Colt Cabana (real name Scott Colton) over WWE ringside physician Dr. Chris Amann, who was suing them for defamation. When Punk left WWE in 2014, he aired all of his grievances, especially the medical ones, on Cabana’s podcast; Amann took issue with some of those and sued in early 2015. Punk claimed both in court records and various interviews that WWE was backing the suit, and while there’s no proof of that in the public record, it’s a common belief among wrestling fans. The trial itself was a walkover by the defense. Amann did not make a good impression on the jury, and revelations about HIPAA privacy violations and incomplete record-keeping meant his reputation likely was harmed more by taking all this to trial—revealing an ethical breach on top of sheer sloppiness—than it had been by some barbs on a four-year-old podcast. As it turns out, there’s more where that came from, and another serious breach of medical ethics: A sexual relationship with a wrestler under Amann’s care. The week before the trial, Amann filed a number of motions, mostly with the intent of making sure that various issues couldn’t be brought up before the jury. Some of these were sealed and thus seen only by the parties to the case, but most were publicly viewable at the computer terminals in the clerk’s office of the Cook County Court at Chicago’s Daley Center. One such motion was especially conspicuous for not being sealed: Amann’s third motion in limine, which argued that at trial, the defense could not reference his romantic and sexual relationships with then-WWE wrestler Jillian Hall and an indie wrestler who he met at a WWE try-out event. Dating patients is against doctors’ codes of ethics, given the innate power imbalance and potential to cloud one’s medical judgment, making this arguably a much more significant offense than anything that Punk accused him of doing. Considering that, seeing the motion in public court filings submitted by Amann’s own legal team was a bit of a shock. WWE doctors already have a difficult balance to strike in trying to honor both the company and the patient’s interests, and a romantic relationship with a patient complicates that further. Caplan also cited the inherent power imbalance in a doctor/patient romance as something that could, for instance, make a doctor less likely to send the patient out for necessary second opinions. “All of the codes of ethics say ‘Don’t do it,’” he said. We were not aware of this. We are investigating the matter and will determine if any action is warranted. Cliff Compton (real name Cliff Treiber), a wrestler and mutual friend of Punk and Cabana, testifying about Hall telling him about the then-active relationship, at a time when Treiber wasn’t in WWE. 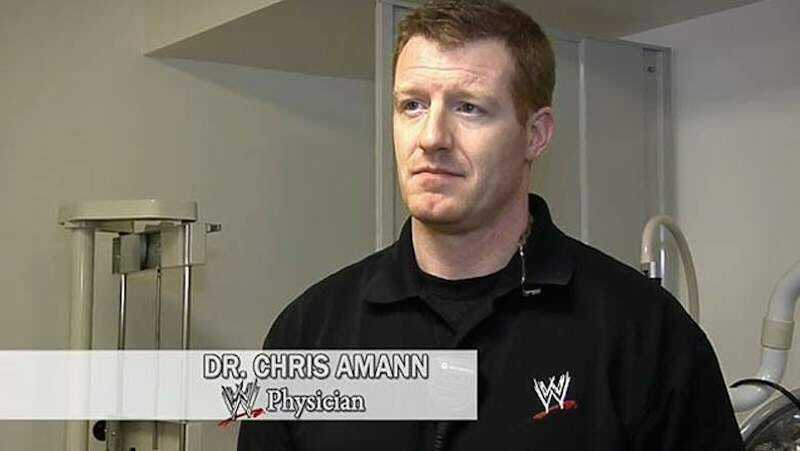 At the time Amann and Hall were dating, WWE only had one doctor on each touring brand, which meant that handling this in a way consistent with medical ethics would involve switching one half of the relationship to the other tour—which would all but eliminate their ability see each other. Caplan noted that even though Amann’s superiors were not medical professionals, they would still have their own ethical duty to step in to end the doctor/patient or romantic relationship. In all of this, there is a nagging question: Why was the damning pre-trial motion, exhibits and all, in the public court record and not filed under seal? After all, Amann’s lawyers filed some other pre-trial motions with the contents hidden from public view, and the motion about his personal relationships with wrestlers clearly had merit because none of this was mentioned at trial. Whatever the answer, though, between this and what came out at trial about Amann violating HIPAA privacy regulations in text messages to other WWE personnel, it looks like his lawsuit turned out to be much more trouble than it was worth.